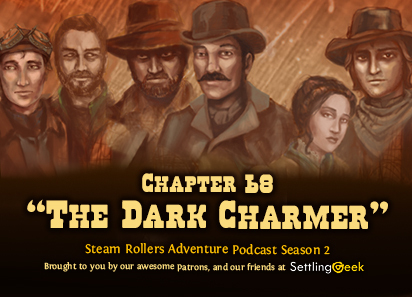 Ep.131 Ch.68 "The Dark Charmer"
In a sudden and unexpected jolt, Adrienne “Shade” Boothe bolts from the Main Street Inn in Peace, leaving Connie, Oliver, and the rest of the crew without a friendly witch helper. 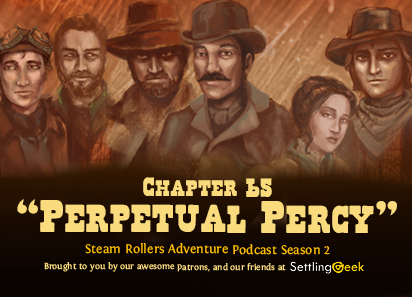 When Connie runs out into the street to stop her, she comes face to face with her Peace nemesis, the Highwayman...and his master. 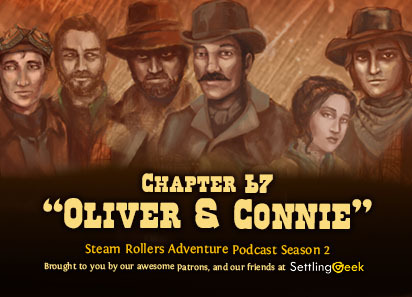 Ep.130 Ch.67 "Oliver & Connie"
While most of the newly-assembled band head off in different directions: Percy is just un-paradoxing himself, Kingsley is trying to make his way back to Peace, Nigel has wandered off yet again, and Sonny and Silas belly up to the bar, Oliver and Connie get a chance to catch up. 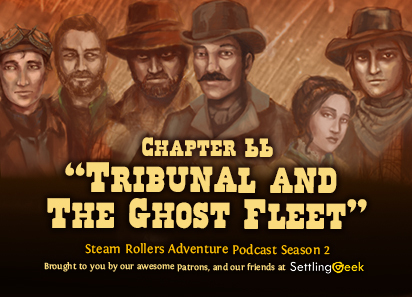 Ep.129 Ch.66 "Tribunal and The Ghost Fleet"